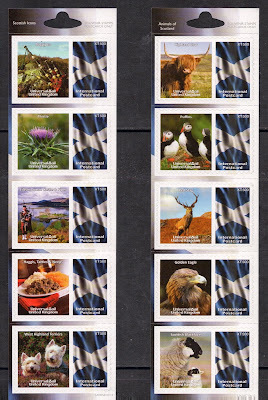 As you may have gathered by now, I’m not always the quickest when it comes to jumping on new philatelic bandwagons. I’m more like a “What do I want to keep that first Smilers sheet for” kinda guy. It is therefore quite amazing that I did manage to hold on to the first ever Machin & Commemorative mixed booklet (the submarines, remember?) in 2001. And even more amazing that I managed to snap up a Machin £2 ‘missing pound sign’ cylinder block within weeks of issue, when they still retailed for only twice the face value. But a lot of stuff just passes me by and I only notice it months if not years after. 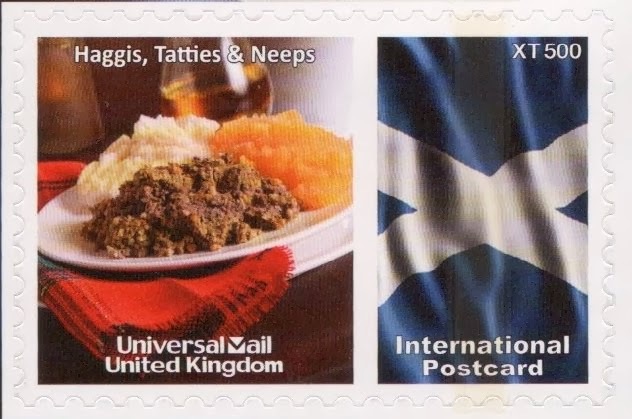 The Post and Go labels were a good example and so are the Universal Mail stamps. 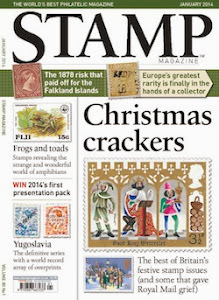 Even reading about them in the latest Stamp Magazine did not trigger any sort of action on my part. It was only when I found myself in Dumfries Tourist Information Centre the other day, that I finally got acquainted with this latest phenomenon. I can’t even remember what I was doing there but while browsing I saw this notice on the wall saying that international postcard stamps were being sold there. Suddenly inspired I rushed to the counter and asked for them. And lo and behold, the lady did produce a bagful of them, in two designs even! Needless to say I bought both. 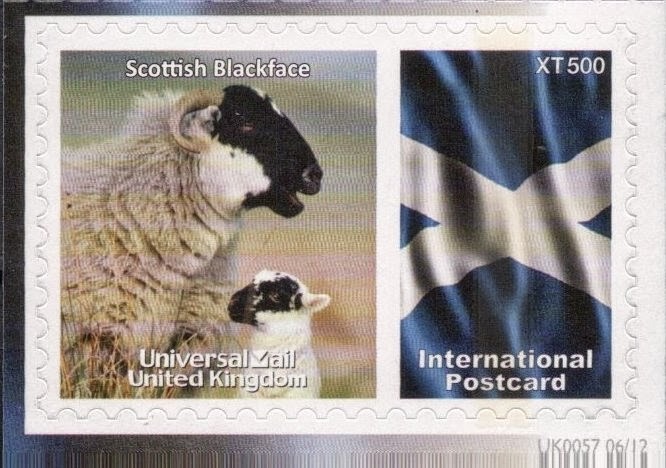 The first one is of Animals of Scotland, issued in June 2012. 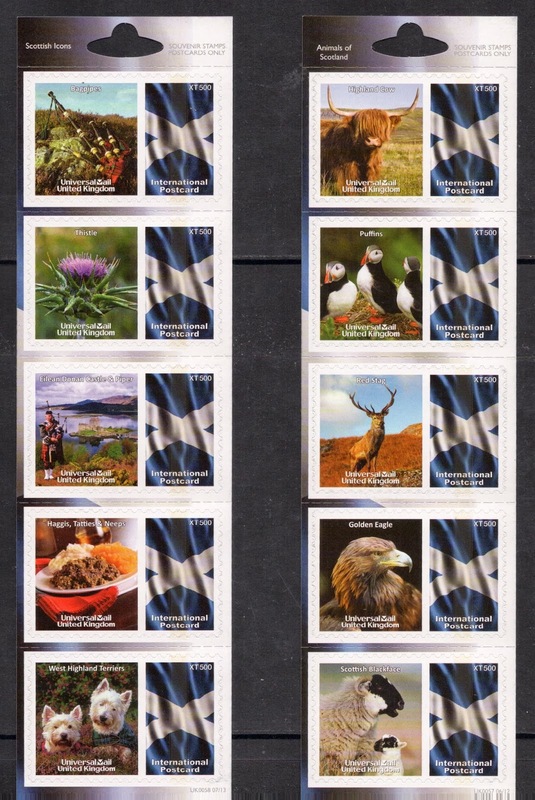 The five stamps show the highland cow, the puffin, the red stag, the golden eagle and the Scottish blackface. 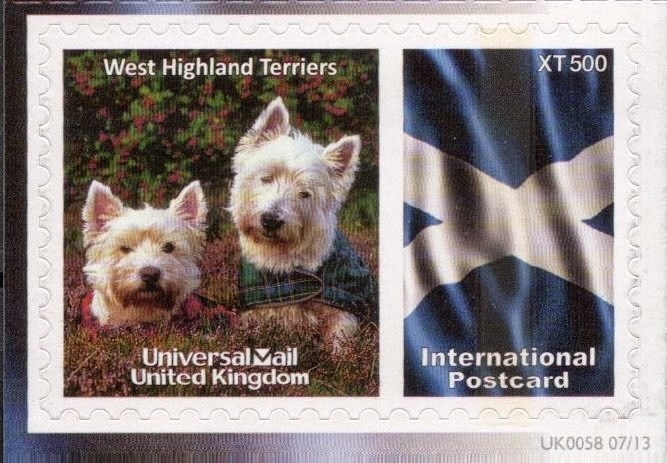 The second strip, from July 2013, consists of Scottish icons, with the bagpipe, thistle, Eilean Donan Castle, Haggis and West Highland terriers being depicted. Looking at the Universal Mail website, I gather there are at least six more general strips that have been issued in Scotland so far. Something I never realised, but found out in the excellent feature in the magazine, is that there are general issues and so-called bespoke issues. For Scotland, there are nine of the latter category: eight issued specifically for Historic Scotland, and one for Eilean Donan. 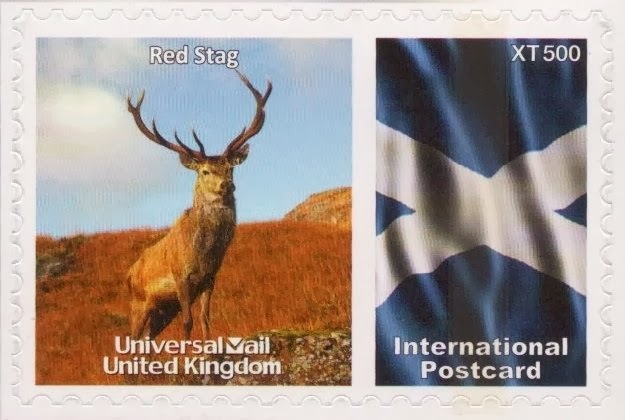 And then there are limited editions as well, but the two issued so far are not specifically Scottish so I can leave those out of my collection. But it seems I may have to do a lot of travelling to get all those different strips. Roaming all the TICs won’t be that hard, but for the bespoke ones I’ll have to start planning visits to the various Historic Scotland sites. Oh well, there’s worse ways to spend one’s days! I don't want to discourage you (or anyone else) from visiting Scotland, but these privately-produced stamps are available by mail order from Universal Mail. Click the 'Collectors' link at the top of the home page.